Our family lived in Paraguay for a couple of years in the early 1980s. I well remember our return to Canada, late 1984, because of how it overlapped with the news that Candace Derksen, a 13-year-old student at Mennonite Brethren Collegiate Institute in Winnipeg, had gone missing. We lived some months in Saskatoon that winter, before returning to Winnipeg, and the fear that all Winnipeg, as well as many in the national Mennonite community who knew the Derksens, were feeling for Candace came along with me. Around the same time, there had been an abduction in Saskatchewan, and I can still see the posters about that on store doors and feel my panic the day our middle child, who was in kindergarten, was late coming home from school at noon. My husband was out of town, I had no vehicle, didn’t know my neighbours yet, and didn’t know what to do. But if my story had a happy ending, Clif and Wilma Derksens’ did not. In January 1985, their daughter’s body was found in an old shed at an industrial complex not far from their home. This month, on the anniversary of that day 26 years later, the trial of the man accused of killing her began. Now, once again, the Derksens are in the public eye, once more their story of heartache becomes ours to share and bear, and once more too their decision to live with forgiveness rather than bitterness inspires us. It was my privilege to be in a writing group with Wilma for several years. She is a wonderful writer, especially in matters of the heart. She has been active in victim and justice work, and has written several books, including the story of their loss in Have You Seen Candace? Cliff and daughter Odia are artists. The family has survived and stuck together. They have chosen to be open and honest with their pain; they have given the wider community much of themselves. Since they’ve always invited others into their story, I have no hesitation in suggesting you may want to follow the trial at the Winnipeg Free Press (Mike McIntyre reporting, Lindor Reynolds column here), or perhaps read Wilma’s ongoing reflections at her blog “Bittersweet,” at the Mennonite Central Committee site Lemonade. 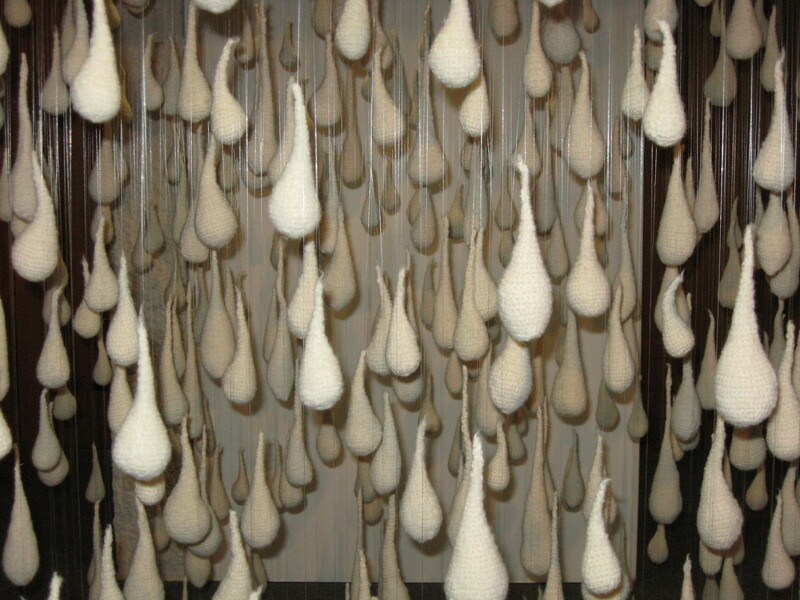 (And here is Wilma’s piece about the “Tears” installation pictured above.) Please keep them in your prayers through the difficult days of the trial, expected to last some 6 weeks. This entry was posted in Current events and tagged Candace Derksen, Cliff and Wilma Derksen, Have You Seen Candace, Odia R. Reimer by doradueck. Bookmark the permalink. Thank you — you are wonderful…..